With an increasing number of referrals to treat balance impairment, gait disorders, and dizziness, A Clinician’s Guide to Balance and Dizziness: Evaluation and Treatment by Dr. Charles M. Plishka looks to address these issues and provides tests, measures, and interventions that are matched to research studies when available, for evidence-based practice. It begins with a review of the anatomy and physiology of the systems used to balance. With a basic understanding of how we balance, the signs and symptoms of patients will be understood with much greater ease. A Clinician’s Guide to Balance and Dizziness enables the reader to perform a complete and thorough evaluation and helps to provide treatment options for identified deficits that place the patient at risk for falls. Along with numerous diagrams and photos, this text comes with access to a web site containing video clips that demonstrate key evaluation and treatment techniques. The result will be a better evaluation, treatment plan, and outcome. • How do we balance? A Clinician’s Guide to Balance and Dizziness: Evaluation and Treatment is an easy-to-use reference perfect for professionals who assess and treat balance impairments and dizziness. While it is an instructional text for physical therapy students and clinicians, it is also a great reference for established physicians, vestibular and balance therapy specialists, occupational therapists, nurse practitioners, physician assistants, audiologists, and athletic trainers. Charles M. Plishka, PT, DPT earned his Doctor of Physical Therapy degree from Creighton University in Omaha, NE. He is the owner of Posture & Balance Concepts, LLC, which offers consulting services, program development, and continuing education courses. He teaches courses on vestibular therapy, evaluation and treatment of balance and dizziness, Parkinson’s disease, and multiple sclerosis. Dr. Plishka is a member of the American Physical Therapy Association and is involved with the Vestibular Special Interest Group and the Mentoring Sub-committee of the Neurology Section of that organization. He is also a member of the Bárány Society, which is the International Society for Neuro-Otology. 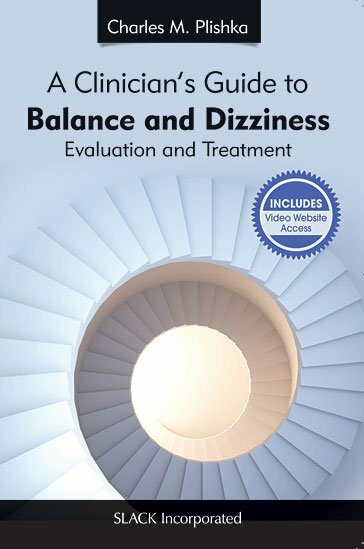 He is excited to present A Clinician’s Guide to Balance and Dizziness: Evaluation and Treatment as an easy-to-use reference and instruction for clinicians who evaluate and treat those patients suffering from dizziness and/or disequilibrium.